~~I've had a lot of questions about my latest painting. I'm sorry that I'm so late to respond to them. I've tried to gather them all together. If you have any more questions after this, feel free to comment or email and I'll do my best to answer them. "Do you work from a photo?" ~Yes, I do work from photographs. I'm a very visual person and I really need to have that reference to help me, plus I love to paint children and we all know that they never sit still,lol. I don't stick strictly to my photo references. I change colors and backgrounds or I might combine photos. I always take my own reference photos (with the exception of some commission work.) I usually have an idea in my head of what I want to paint and then I try to get good reference photos to help me visualize it better. "How do you decide which colors go first, start with the shading and finish with highlights?" ~I paint on Fredrix watercolor canvas which allows me to paint in the same way that I do colored pencil work. What I mean by that is that I use thin, semi-transparent layers and build the color up from light to dark. I use the white of the canvas as my whitest white. All of the white you see in the Peace painting is actually the canvas showing through with maybe a light layer of color. Some areas, like hair, are a bit different. In the hair I establish the darkest darks first, leave the lightest lights, and then paint the mid-tones. "Are you working in acrylic and then water it down?" 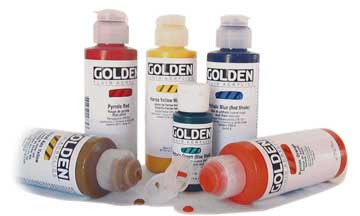 I bought a selection of Golden Fluid acrylics when I first started trying out this canvas. I like them so much that I plan to start replacing my other acrylics with them. This painting was done with a mixture of the fluid acrylics and also regular thicker body acrylics that I thinned with water. The way I paint with them is very similar to using watercolor. The reason that I chose acrylic over watercolor is that the acrylic drys quickly and permanently and I can then layer over it with another color. "Could you please tell me how you create that lovely marbled background in your paintings?" I stumbled on this technique while playing around with the watercolor canvas. I first painted a layer of acrylic in the background. In the Sisterly Love painting, I used a light blue-green. In Peace I used a light brown. When the acrylic was completely dry I floated puddles of Burnt Sienna and French Ultramarine watercolor next to each other. I let them puddle and do their own thing, which can be a bit scary for me! On the Peace painting I also sprinkled salt over the canvas while it was wet. When I was completely finished with the painting I sealed it with a couple coats of acrylic varnish spray. Otherwise the watercolor background would be subject to smearing or rubbing off. "Have you ever thought of doing an online class, cause I would sign up." ~I do have a lot of big dreams and teaching is something that I keep coming back to. I've had opportunities to teach classes locally and I may do that in the future. Who knows, it may someday lead to an online class, I'm not sure. You guys would really want to take a class with me?! "Did you go to art school or are you naturally gifted?" First I have to say "Thanks." to Nomad. That's really sweet of you to say. I don't feel like I'm gifted. Art is just something I've done from the time I was a little girl. It's just a part of my life, like breathing. Life wouldn't be the same without it. I took art classes starting in Junior High and all throughout Highschool. I also got my Associates degree in Visual Arts. That being said, I do not believe that you have to have schooling or some sort of degree to be an artist. To be honest, I've learned so much more in my post-college time. I wouldn't really say that I'm self-taught. I'm just constantly soaking up everything that I can. I read art books and magazines. I find artists that I love and analyze their work, asking myself what it is that I love about it. I've spent time on forums such as Wetcanvas and Scribbletalk, learning from others. I've taken some workshops and classes. I just love art of all kinds and that passion drives me to learn more and strive to become better. I do love realism and I think the biggest lesson I learned was to trust my eyes and ignore my brain. Whatever colors you see....paint them. Even if your brain is screaming that they can't possibly be there. Trust your heart and do what you love. Ah, colored pencils. I never mastered prisma's in school, so sign me up if you offer a class! Thanks so much for sharing! Yes, I would take a class from you! Teaching is a blast...you learn so much from the participants. I would totally take a class from you. I love pencils, but have always had trouble with paint, so I think your colored pencil painting style would suit me just right!